CombatCritic's "TravelValue": El Patio de Sam ... More Like El Yucko de Sam! Santa? What Are You Doing In This Dump? San Juan, Puerto Rico: We came for the piña coladas... advertised prominently out front as "2 for 1" until 7pm weekdays ... and decided to try a burger ($10.95) with cheese and fries because the server told us "our burgers are the best, not only in Puerto Rico, but in ALL OF THE US!" We trusted her, first mistake! Our burger FINALLY arrived after 30 minutes and was slightly bigger than a White Castle (Whitey One-Bite). There was no sauce, the patty (advertised to be 8 ounces) was small, maybe 5 ounces at best, and accompanied by a pickle spear, very small slice of tomato, and a little lettuce. The fries were shoestrings and not many of them at that. We finished the sandwich literally in less than 3 minutes and I am not a fast eater by any stretch. 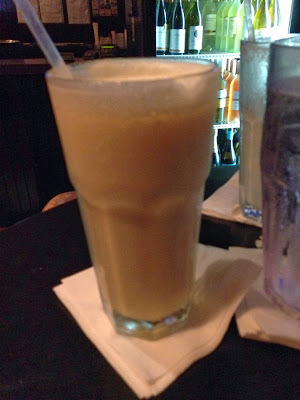 Thankfully, the piña coladas ($9) were large and tasty, not strong, good, but thank God it was happy hour because they were way overpriced … $33 for two drinks and an itty-bitty burger ... Never again! CombatCritic Gives Patio de Sam 3 Out of 10 Bombs ... BOMS ARE GOOD!